A couple of weeks ago at our seminar, I met Zoe. (By the way, check out the Events page for our next seminar, scheduled for June). Zoe told me that she had found the new ‘Secrets of the Universe’ flashcards on our website (you can find these under the Education Tab in the sidebar). These resources were developed by others, and are designed to assist people in learning English while simultaneously learning about Divine Truth. Well, actually I think that Joy & Jenn, who created the cards, are fairly relaxed about how they are used i.e. I think they would be thrilled to know that they helped anyone in any way. Which is why I’m excited to tell you about what Zoe, Angel and Eden have been up to. Zoe printed out the cards and showed them to her kids, Angel and Eden. After discussing each one, and what it meant, she asked them if they would like to make their own book out of their favourite Truths (each card depicts one of the Truths from the Secrets of the Universe talk). 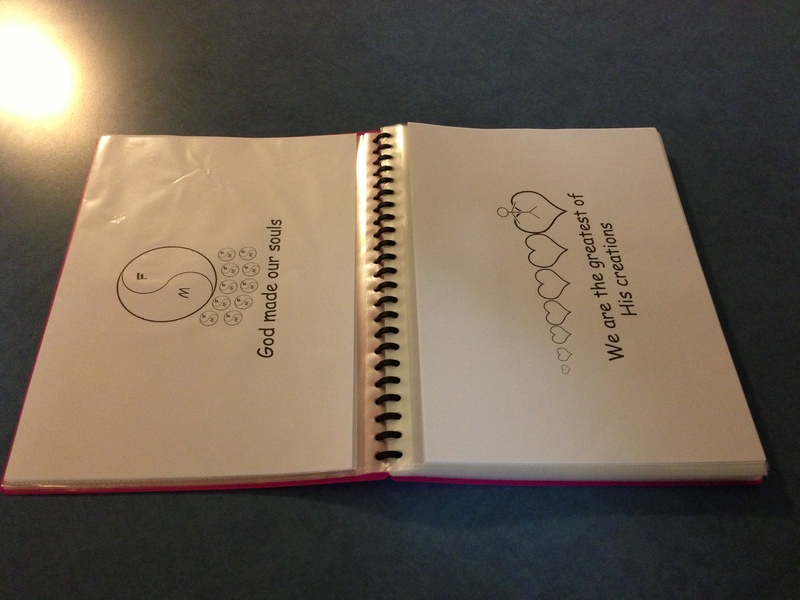 The kids got to choose the colour of their booklet, and which Truths about themselves they would like to be in it. Zoe laminated the relevant cards and helped the kids put everything together. 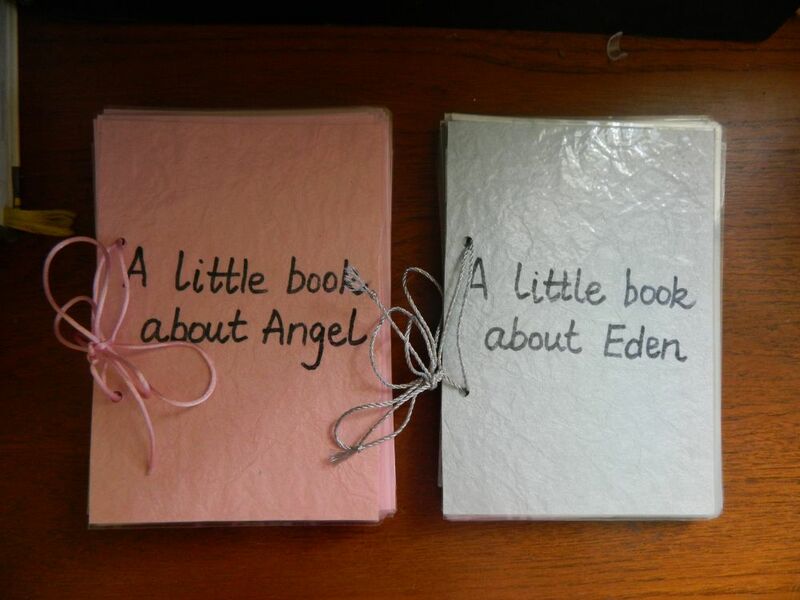 Zoe told me that now Angel and Eden love reading their booklets to themselves or sharing them with visitors, like Nana and their other playmates. 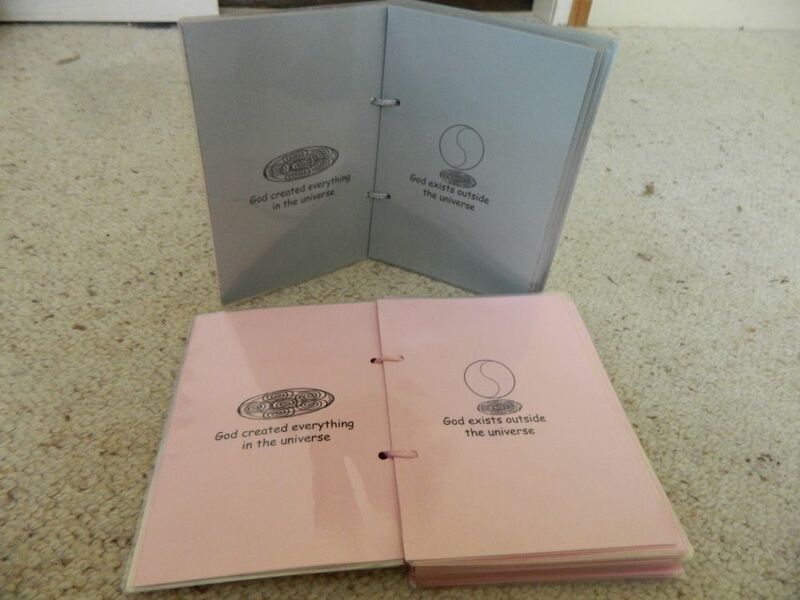 Zoe was really pleased to have a creative way to help her young children (from memory they are aged 3 & 5 yrs) understand their soul’s and God’s Love for them. I love way she used the cards to simply present Truth, and then let the kid’s natural curiosity and personal desires lead in the creation of their books. Thank-you Jenn and Joy for making such a resource available. *** Addit 1: I heard from Jen – a big kid 🙂 about her own experiment with the flash cards. I’ve added her photos here and she’s left a comment below. *** Addit 2: I wrote to Zoe about the post and she wrote me back. You can read it below.. I posted your project on my blog. I wrote everything from memory of the brief conversation that we had so please feel free to correct me if I got any of the details wrong. Thanks for letting me share – I feel that it will inspire other parents – which is great hey? Yes it’s all pretty much right except that the kids didn’t choose their favorite cards before making their books. We just made the books with me arranging them in linear order as the sequence made such sense to me I couldn’t resist! After reading your blog however I think that’s a much better idea to let them choose each card they are drawn to and build a book as we go. So I will ask them if they want to do that. Aside from letting their desires lead that way its also an ongoing project as we can keep adding and maybe subtracting cards. They did choose which ones they liked the most when we were making them but I still made sure they were in order, haha. So I think I better print some more and make my own book in ORDER! haha. This entry was posted in DT4Kids, Lifestyle and tagged Secrets of the Universe on May 22, 2013 by Mary. This is so cool!! Thanks Zoe, Eden and Angel! We think this is a great idea!!! And Thank you AJ and God!! Truth is awesome! Wow, I didn’t know these existed. They are fantastic! Thank you very much everyone who was involved in creating them. We will have fun with them and I’ve been looking for ways to communicate God to our child and others and haven’t been sure how to do it myself. Thank you! I discovered these flash cards on your website a couple of weeks ago, I felt like a little child discovering my favourite story book for the first time. I printed them straight away and put them into a folder for my family to read, but not before I sat and read them all first. I then printed the little flash cards and laminated them. 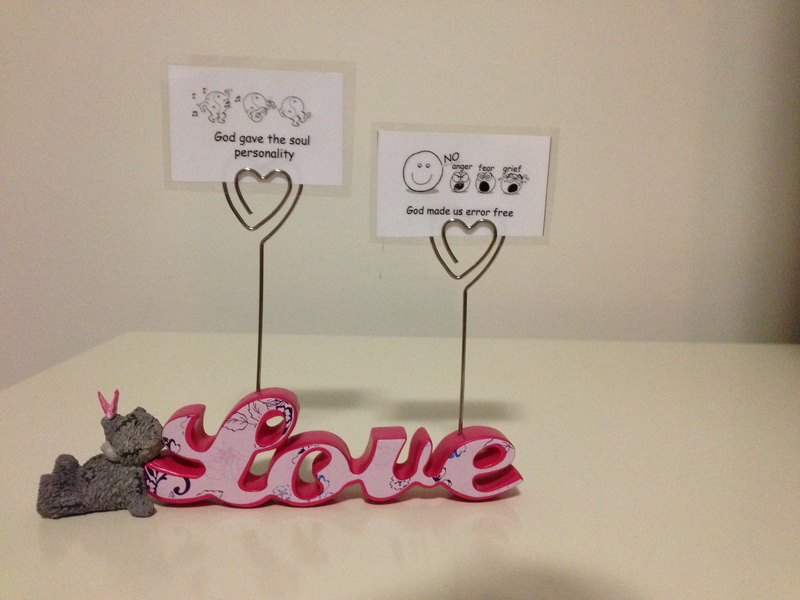 I found this love card holder stand in a gift shop and each day I change the cards so it tells the story. They brought me much joy & my teenagers like them too. Thanks for putting them on your website and thank you Joy & Jenn.